This week I have got together with 5 other bloggers to style the same Next bomber jacket. Here we all are wearing the jackets are own individual way! Last but not least.....it's me! As you can see this jacket is so very versatile! 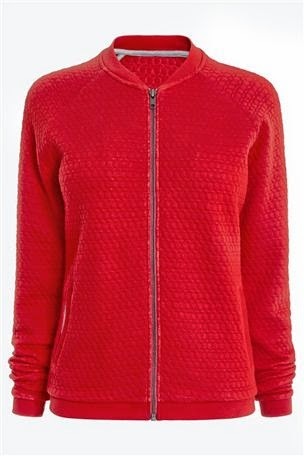 It's a lightweight, non-lined quilted jacket which comes in the 2 colours grey and red. Here's a closer look! 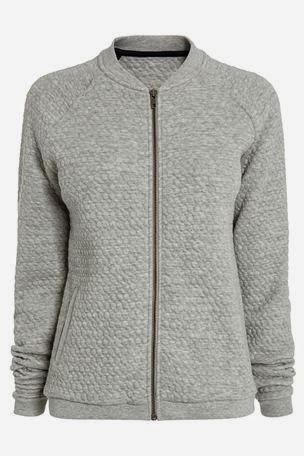 The Next spiel about it goes like this....... 'A casual bomber jacket made from quilted fabric. Features raglan sleeves, front pockets, rib trims and binding detail inside'. The fabric compostion is 73% Cotton, 25% Polyester and 2% Viscose which makes it machine washable....yay! There are so many ways that this superb little jacket can be styled.....here are more than a few different things that I have done with it whilst having a trying on session! I think you'll agree, it's a great little jacket which I am already planning to style in various other ways......expect to see it a lot! What's you favourite look out of all of the above? Anything else you like to see me wear it with? Disclaimer - I was gifted this jacket by Next but all views are my own. Oooh you have given me even MORE styling ideas for a post later this week! The maxi dress with the jacket is GENIUS! You have inspired me too! Will definately be wearing my jacket with white skinnies! Love how you've styled it with the maxi dress Michelle, just stunning. Wow - so many ways to style this - it's a good thing it's not me doing this as you'd get it with a tee and a pair of jeans because I am such a sad creature of habits! And I knew you'd go for grey over red - so would I but only because red scares me! And you're doing pink! What a great little find! Thats such a pretty shade of pink too - when you get the right shade, anyone can do pink! Right I'm off to see the other girls now! Lol Sue....my reaction was just the same......ohh can I have the grey as the red is so out of my comfort zone.....mind you know I've seen it on Joanna, Frances and Liz I want the red as well!! Of course my main pic would have to be a Breton and jeans as I hold my hands up to being a creature of habit too! Oo, I do like this! I don't tend to wear much 'casual' wear, but I could see myself wearing this maybe as part of my workout wardrobe - perhaps over leggings or shorts if I'm doing something sporty, like going to a yoga class. Love this jacket Michelle and like you I would have probably put it over a breton but having said that, I think my favourite look of yours is the first picture over all black. I love how versatile it is and I think you have proved we should all have one! Love all the looks Michelle. Now off to see School Run Mum! Hello Sharon! Isn't it a great little jacket?! I've loved seeing how everyone else has styled it....it's certainly has given some more ideas of how I can wear it! I'm now trying to remember what shorter Summer dresses I have that I can wear it over as I love this with the maxi! You really suit this style of jacket, love all the different looks and will be trying some of them! Loved reading this post!